Just how 'indiginious' is India's weapons technology? Indian propagandists over the past decades have been propagating & exaggerating foreign involvement in Pakistani weapons projects (including nuclear) while staying silent and working to cover-up any foreign involvement in their own weapons programs. They have done a fairly good job at it, because now days it's very difficult to dig out sources which point towards serious Soviet involvement in India's nuclear weapons program; hence the Indians have been able to portray it as 'indigenous' along with other hi-tech weaponry they possess. They have launched this propaganda all over the Internet including wikipedia, or quoting their self-proclaimed "analysts" like the person who goes under the name B. Raman who has a favorite past time in spreading and exaggerating the weaknesses of Pakistani military tech. Not only have they been very successful at deliberately exaggerating/falsifying foreign assistance to Pakistani weapons programs, but also it appears they have even imported foreign weaponry and simply given an Indian name to it to make it look 'indigenous', without having any involvement in it's construction at all! Additionally, they have been on a propaganda campaign to claim success in alot of their tested weaponry and missiles, when most of them have miserably failed. The videos posted below proves the failure about Indian missiles along with other "indigenous" equipment allegedly made by India when some of them appear to be exact duplicates of European military equipment. Can this be a coincidence, or simply imported equipment with an India tag labeled to it? The videos below contain direct statements from Indian "scientists" & "engineers" as well as clear coverage from the Indian media. Indians who also whine and cry about Pakistan being crushed in another Indo-Pak war without alliance to America or China or other countries, should know a few things. 1) The first Indo-Pak war took place in 1947, before China and Pakistan forged an alliance. India on the other hand was already allied with the USSR and also the British had left most of their military equipment with India than Pakistan at the time of their departure from the subcontinent. Despite all this plus the larger size of the Indian military, they were unable to take all of Kashmir away from Pakistan. 2) Another full scale war will involve nuclear weapons, which will be enough to destroy BOTH countries. Additionally because India is much more densely populated than Pakistan, more people in India will suffer/die in the event of nuclear exchanges between both countries. 3) Those who rejoice in the 1971 war, already know it was an unjust fight. The Pakistani military was at civil war and a thousand miles within enemy territory. Conclusion: 1971 war doesn't really count since it was not a straight one-on-one war. There was no 'partition' of "India"
THERE WAS NO “PARTITION”: For Britain ” ‘Indian’ Empire” included Somalia, Iraq, Burma, Singapore etc. For the French “India” included Vietnam (Indo-China). For the Dutch “India” included “Indo-n-asia”. Some truly educated historians and many educated Pakistanis in particular take deep umbrage and dislike the usage of the term “partition” because “partition” implies the division of a whole. As the maps show, the term “India” was very ephemeral and put in vogue by the British. Before British times, there was no such word. Because there never was a country called “India” there was no "partition"
Initially when Lord Clive of the East Indian company defeated Shirijud Daulah, he called it British Bengal. When the British formally came to the Subcontinent in 1857, they encountered more than 570 states. When they left the Subcontinent they left more than 570 independent states and two dominions, India and Pakistan. The states on the banks of the Indus decided to live together as Pakistan, as they had lived together for thousands of years. The states on the Gangetic plain banded together to form “Bharat”. The state on the Brahamaputra became its own state. Each state had its own currency, laws, jails, flag, crest, passport, military, treasury, and British forces were not allowed to enter the state. Many were ruled by Muslims rulers like Hydrabad, Bhopal, Junagarh etc. 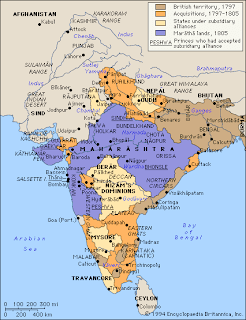 Maps showing various sovereign, independent states in the Subcontinent during the British Raj. The separation of Burma is not called “partition”. The independence of Sri Lanka is not called “partition”. the removal of Iraq from the British Indian Empire is not called “partition”. The independence of Nepal, Sikkim, Bhutan is not called “partition”. Aden and Somalia becmae independent in the British Indian Empire and are not lamented as being “partitioned” off. For the French, sperating Vietnam from their Indian Empire is not called “partition”. For the Dutch, removing Indonesia from Dutch “India” is not called separation. “Pakistan” existed 5000 years ago. 5000 years ago Pakistan was probably not called “Pakistan”. China 5000 years ago was also called something else. Egypt 5000 years ago was called something else. Kushan Parthian maps show different parts of the world. Portugese map shows. Notice Pakistan labelled Sindh and "India" as Hind. Also note that the name "Hind" is derived from Sindh. So yes, even the roots of the words "Hind" "Hindi" "Hindu" "Hindustan" all originate in present-day Pakistan. These words are a result of the corruption of the original name "Sindu" meaning land of the rivers which was Pakistan's name in 3000 BC. Map of Timur's empire, which included Pakistan, but not "India"
The Pakistan proposal “Now or Never” was not based on any partition. It was based on the Muslim majority areas coming together. Countless maps of pre-47 Pakistan can be found including different time eras most of them excluding present-day "India"
“Notwithstanding [a] thousand years of close contact, nationalities which are as divergent today as ever, cannot at any time be expected to transform themselves into one nation merely by means of subjecting them to a democratic constitution and holding them forcibly together by unnatural and artificial methods of British Parliamentary statutes. What the unitary government of India for one hundred fifty years had failed to achieve cannot be realized by the imposition of a central federal government. It is inconceivable that the fiat or the writ of a government so constituted can ever command a willing and loyal obedience throughout the sub-continent by various nationalities, except by means of armed force behind it. Quaid E Azam Mohammad Ali Jinnah: Founder of modern-day Pakistan and the Father of the state. Pakistanis and historians detest the word that incorrectly describes the genesis of the country that has existed since time immemorial. So why do people believe this whole falsified term "partition of 'Inida'" Indians have been involved in a massive propaganda campeign for the past 60 years including making movies, writing books, articles, propmoting historic distorsion. Hitler had a saying. Speak a lie, keep repeating it and everyone will believe it. The term “india” stems from the Arab usage of the word Hind from for the inhabitants who lived on the Sindhu (Indus) river. From Sindh to Hindh. In time all residents beyond the Indus were also called Hindus. The Western states, Kalat, Bhawalpur, and provinces Punjab, Sindh, Baluchistan, and NWFP banded together to form “Pakistan” and decided to live together as one country just like they had lived together for thousands of years before the British arrived in the Indus Valley Civilization that existed almost entirely on the banks of the Indus. The states of the Gangetic Civilization that existed on the banks of the Ganges banded together to live form Bharat(constitutional name of “India”). Pakistan had objected to the name “India” being used by Bharat. These maps show the British Indian Empire which included many states. The other maps detail the condition of the Subcontinent on the eve of the British departure.There never was a country called “India.” The Arabs never ventured past Sindh. The nomenclature was for those on the river Indus as Sindhu or Hindu. ”India” is a colonial derivative of the word. During British Times vast areas of Asia came under the jurisdiction of Britain. Iraq, Somalia, Burma and 526 states in the Subcontinent were all part of the British Empire. When the British were leaving all the parts were made independent.Of these, Somalia, Iraq, Burma, and Pakistan are some of the countries that got liberated. There never was any partition because there never was a “whole” to divide. At one point Afghanistan was also part of the British "Indian" Empire. Curzon’s retreat from Afghanistan, and its separation from the “Indian” Empire was not called “partition”. The separation of Iraq from the Indian empire was not called partition. The separation of Aden from British India was not called partition. the separation of the gulf states from “India” was not called partition. The independence of Burma from the British raj in 1933 was not called “partition”. Why is the Pakistani independence called “partition”, as if it was part and parcel of a “whole”. THE FOUR SUPERPOWERS OF EARLY HISTORY: China, Egypt, Iraq and Pakistan. The Nile, the Tigris-Euphrates delta, the Yangtze Delta, and the Indus, are the wombs of all civilizations on our earth. These river valley spawned and nurtured humanity. Imagine a world with four superpowers at peace with each other. Imagine a planet where each civilization was immersed in humongous construction projects, urban edification and trade. . How did these proto-world powers interact with each other? Imagine a civilization without any implements of war. Let us look into pre-history and peek into the “seeds” of time. Let us look at the valleys of the world that engendered the Superpowers of the ancient world..
PAKISTAN 5000 YEARS AGO:-The Indus Valley Civilization of South Asia was one of the inceptive civilizations on the planet. It was contemporaneous with the Chinese, Egyptian, and Sumerian civilizations. These were the times when the Egyptians were building huge monuments to their God-kings,the pyramids and the Sphinx. These were the centuries when the Chinese were building palaces for the Shun dynasty. These were exciting eons in the Holy lands too. These were the centuries when Moses was battling the pharaohs, Abraham was building the Kaaba, David was ruling the kingdom, and Solomon was building the Temple of Yahweh. It was during these centuries that the Indus Valley Civilization flourished and reached its zenith in South Asia. The IVC built well planned municipalities for its citizens. While the Egyptians spent three generations of their labor force (estimated between 20,000-10000) building useless mausoleum-pyramids to bury the God-kings, the Harappans were successful in eradicating, disease, hunger, and malnutrition. The Harappans of the IVC did not build huge commemorative, deifying, dedicatory, cenotaphs. The Harappans of Meluhha-IVC built the finest cities of the third millennium BCE. Because the Subcontinent was never “one” country, there are deep fissures in “Bharat.” The Kashmiris, the Naxalites, the Northeastern states, as well as East Punjab, and Tamil Nadu on the South all want to revert to the pre-1947 era. Pan-Indo-Iranism might be the only nationalistic ideology to re-unite Pakistanis outside of religion. Perhaps the only way to redraw Pakistani nationalism is by spreading Pan-Indo-Iranism or at least base it on a common Indo-Iranic identity. Let us provide a background on Indo-Iranic peoples. Up to to 99% of Pakistanis speak an Indo-Iranic language as their mother tongue.There are about two dozen languages spoken in Pakistan, still 99% of them are Indo-Iranic. The Indo-Iranic language family can be broken down into four subgroupings. Linguists sometimes say three or even two, but we'll mention all four anyway. Indo-Aryan- the main ones in Pakistan are Sindhi & Punjabi and ofcourse Undri/Urdu. Nuristani-Another assumed subfamily of Indo-Iranic but spoken in north eastern Afghanistan, not Pakistan. Indo-Iranic speaking people do not necessarily form a common race, but inside Pakistan they do to a very high degree. Almost all of Pakistan's population belong to haplogroup R1A. If a person were to search for the distribution of haplogroup R1A on the world map, it covers almost entirely all of Pakistan. Indo-Iranic peoples as a language group includes peoples of non-Indo-Iranic origins as well. For example the Hazaras of Afghanistan are mostly Mongoloids, belonging to haplogroup Q, but today they speak an Iranic language Dari. This does not automatically put them into the Indo-Iranic family or automatically place them into haplogroup R1A or any sub-group of haplogroup R for that matter. Rather it places them into the Indo-Iranic language group, which would exclude them from Pan-Indo-Iranic ideologies or movements. Besides the Hazaras maintain their Turko-Mongol culture & identity even today. Coming to Pakistan, Indo-Iranic speaking people in Pakistan do have more in common beyond just linguistics. As our previous article(s) stated Pakistan has a high frequency of R1A gene markers. Kashmiris have it the most Pashtuns are also amongst the higher carriers. Plus all of Pakistan's Indo-Iranic population is Caucasoid. A clear case of common ancestry in almost the entire populations. In Iran, India, Afghanistan, Iraq you have different peoples from different language families belonging to different genetic haplogroups as well. So it is good to believe a common Indo-Iranic identity is what can unite & define us. Pashtuns it is said believe are the closest genetic relatives of populations living inside Kashmir. This can give us a strong claim over Kashmir's population, even outside of religion. Even Kashmiris also don't relate themselves with Indians racially or culturally. Even though Indo-Iranic speakers spread all the way to Bangladesh, they don't share common genetics. Even though we are commonly compared to North Indians, their R1A percentage is still lower and it would drop significantly if they let go of Kashmir. Indian Brahmins have alot of it but alot of sources state that they fall into haplogroup R2 which is still in haplogroup R, but very distantly related to R1 by generations. People in Pakistan belonging to haplogroup R1 are even closer to Europeans than to the R2 careers in India. Plus it's still a minority of people living in a small portion of Northwestern India. Our main point is, spreading pan-Indo-Iranism wont mean having to unite with Indians & Iranians and other Indo-Iranic speaking peoples. A main highlight of Pan-Indo-Iranism would be the common R1A haplogroup (and a little R1B in the north western areas), pointing to a common ancestor(s) of just about every ethnic group in Pakistan. And ofcourse common linguistics & culture. There's a good chance that there are still remainders of proto-Indo-Iranic culture & mythology today in Pakistan, such as the endangered Kalash who still practice it or at least a form of it. There are many books on Indo-Iranic peoples. But what is Pakistanis opinion on our Indo-Iranic identity? Surely, we do not speak a common language in Pakistan today (most countries in the world are multilingual anyway), we do not have 100% the same culture today in Pakistan, but rather closely related cultures & languages. So how else do we draw out our identity if not for a common Indo-Iranic identity? What else do we have in common besides this? Religion is another, but the problem is not all Pakistanis have the same religion, and even the Muslim majority is divided into sects which has caused alot of violent friction amongst the population. Though the term Iranic is regularly called Iranian, Iranic is the more correct and accurate term. Iranian today refers to a person from present-day Iran whereas Iranic refers to the language family (and sometimes racial & cultural, if the speakers of the Indo-Iranic tongue belong to a common haplogroup of R1A).